You will love the sweet-looking style of the Daily Belt from Leatherock®. Distressed leather belt. Two leather belt loops with antique metal studs. Oval metal buckle embellished with multicolored stones and antiqued studs. Spot clean only. Made in the U.S.A. with imported materials. Measurements: Width: 1 1⁄2 in First Hole Length: 35 in Last Hole Length: 39 in Weight: 8 oz Product measurements were taken using size LG (36" Waist). Please note that measurements may vary by size. You will love the sweet-looking style of the Daily Belt from Leatherock®. Two leather belt loops with antique metal studs. 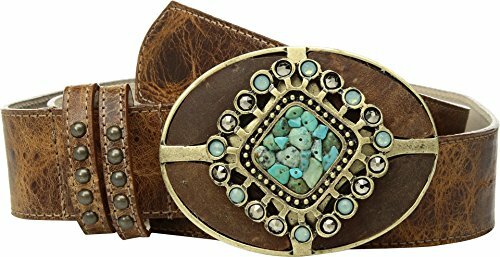 Oval metal buckle embellished with multicolored stones and antiqued studs. Spot clean only. Made in the U.S.A. with imported materials. Measurements: Width: 1 1⁄2 in First Hole Length: 35 in Last Hole Length: 39 in Weight: 8 oz Product measurements were taken using size LG (36" Waist). Please note that measurements may vary by size. If you have any questions about this product by Leatherock, contact us by completing and submitting the form below. If you are looking for a specif part number, please include it with your message.